I've worked on these project/gift bags all summer long and finally finished them so they could get uploaded to my Etsy shop (KMSHandmade) just in time for the Etsy Labor Day Sale. The sale is on now through Monday. Everything in both of my shops (also KristinShieldsArt) is on sale at 10% off (free shipping every day too!). If you need a small knitting project bag, these are perfect for one skein projects like socks or a scarf. They also make great gift bags. I've given them to friends filled with pretty soaps, lovely teas, or a skein of beautiful yarn. They are fully lined and made with gorgeous cotton/linen blend fabrics like Robert Kaufman Essex solids and prints, Kokka prints, Cotton & Steel prints, Japanese prints and other quality cotton/linen blends. I just happened to have all these fabrics in my stash and realized I was never going to make quilts with all of them. The good news is that I have odd sized leftover pieces, so I'm sure many will show up in quilts here and there in the future. Prints include lots of great modern abstract and representational prints. There are also fun, whimsical animal prints including sloths, elephants, birds, polar bears, owls, squirrels, and more. There are several made from Valori Wells prints. 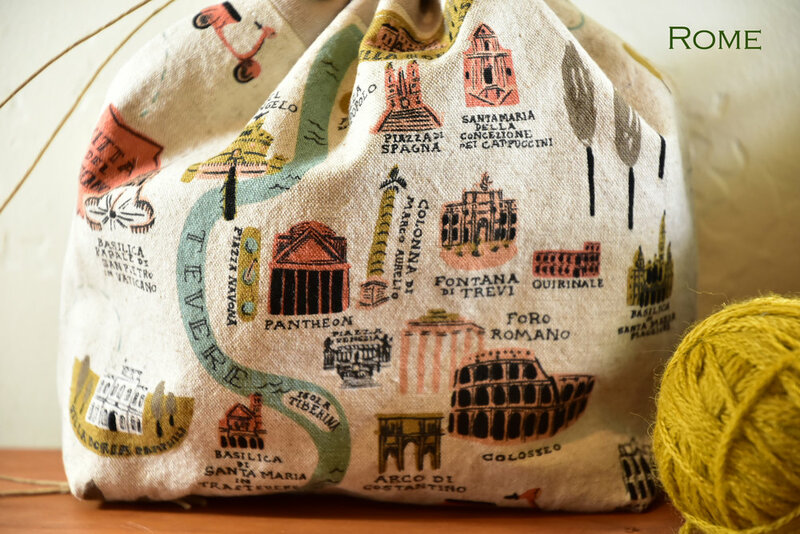 There are also a limited selection of interesting map prints of famous cities including Rome, Sydney, Bangkok, London, Paris, New York City, Tokyo, and Amsterdam. I am waiting for some cording to arrive, so if you don't see something I've mentioned, let me know, and i'll get you more information. Good news for local folks! Next week I will have select bags available for sale at Wool Town in downtown Bend. I'll post here when that happens. Here are a few of the prints I mentioned. Please check out my KMSHandmade shop for lots more.